You can take the whole gang camping in this Autumn Ridge Outfitter travel trailer. 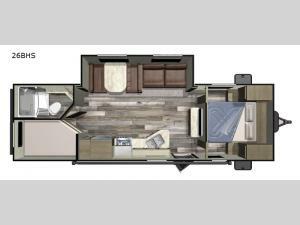 Model 26BHS features a set of double bunk beds, where there is sleeping space for four people so you can camp with a guest or two! You will appreciate the spacious interior thanks to the slide out along the roadside and within the slide out there is a booth dinette for you to enjoy your meals at. Plus a sofa where you can relax after playing outdoors. At night, you will want to retreat to the front bedroom where you will find a comfortable queen bed and closets on either side so that you can be dressed your best. There is also an entertainment center big enough for all to enjoy!